When my husband asked a well-traveled European friend where our family should spend a month in Europe, his emphatic reply was Riva del Garda, Italy. With three young children, ages 6, 4 and 3, we needed a place that provided lots of activity to keep the little ones entertained. Lake Garda delivered in style! One thing to note… Riva del Garda is primarily a European vacation destination. Don’t be surprised if English is not spoken as often as other tourist regions. German will get you much farther than English in this part of the country. Riva del Garda is located on the north side of Lake Garda in a little valley surrounded by mountains. At the top of the valley, Arco Castle is nestled into the southern edge of the Italian Alps, providing a spectacular view of Lake Garda and the surrounding mountainside. A 30-45 minute hike up the mountainside brings you to the castle, which is open to the public. The flat, grassy castle grounds provide space to run, awe-inspiring views, and the perfect spot for a picnic lunch. Riva’s beachfront was designed with families in mind. Activity abounds amid spacious lakefront walkways, waterside restaurants, cheerful gardens and a glorious sandy beach. Rent a paddle boat to see mountains reflected in Lake Garda’s crystal-clear water. Or venture out on a windsurfer! Riva also has playgrounds in plentiful supply. Massive trees surround the old town playground, which has an array of modern equipment. The beach has its own playground and wide grassy lawn with lots of room to run. Our kids’ favorite playground is beside an old church out of the town’s center, near the road to Tenno. The highlight is a zip line that is just the right height for kids 4-10. Continuing up the mountain road toward Tenno, you’ll want to stop at the infamous Varone Falls. Don’t miss the epic Gelato at the little shop just below the falls parking lot. Our kids claimed it was the best in Riva! 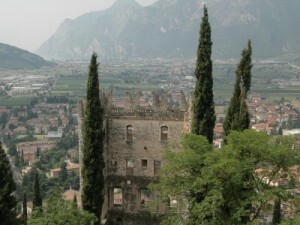 The little town of Tenno is perched 10 minutes up the mountainside above the town of Riva del Garda. A few minutes beyond Tenno, watch closely for signs to Lake Tenno’s parking lot. The isolated, pristine waters will delight you and your children. A few bread crumbs reveal the huge fish that reside in this idyllic mountain lake. Taking a tram to the top of Monte Baldo with dinner at a waterfront restaurant in Malcisne on the eastern side of Lake Garda. Taking the ferry to the ancient town of Limone on the west side of Lake Garda, where the townspeople are rumored to have unusually long life spans. Visiting Rocca Scaligera castle in Sirmione at the southern end of Lake Garda. This well-preserved structure transports you back to the time of princes and princesses, knights and knaves. If you are craving modern American-style entertainment, Gardaland is a Disney-style amusement park that will delight guests of all ages. Riva del Garda provides everything you need to create lifelong memories for everyone in your family.